One way to take care of your vehicle graphics is by properly cleaning your car. The other way is protecting it from outside elements such as the scorching sun. During the summer, it is best to keep your car in a garage or under a shaded area as too much sun exposure quickly fades the colors of the graphics. To prevent extreme heat from damaging your car graphics, keep it hidden from these elements when you’re not driving. A new problem that has arisen in Southern California, Arizona and other parts in between is “acid dew”. Wrapped vehicles in these areas have been failing because of this rust-like, corrosive accumulation that erodes the laminate. Acid dew does not only affect vehicle wraps, it is also a problem to other vinyl graphics in the region. The sun is not the only enemy of vinyl graphics. Pollutants can also affect them, usually before the sun does. To avoid this, keep your car clean by washing it regularly. Every morning, spend at least 5 minutes dusting off your car and giving it a quick wipe. Harsh weather conditions and pollutants can greatly affect your graphics’ performance life. Without proper care, you won’t be able to get the most out of your investment. Aside from properly cleaning your car and keeping under a covered area, there are many other things you can do to protect it from these elements. 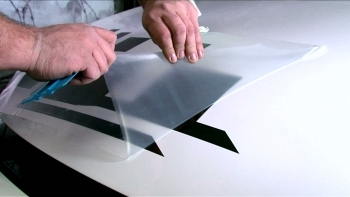 You can apply an added layer of protection by over-laminating it or avoiding parking in the same direction every time. Waxing it is also a good idea for protection. Your paint and graphics will surely thank you for it. Lastly, avoid pressure washers. While they may be faster and saves you the trouble, they could take a toll on your car’s graphics. Instead, take 5 minutes of your time to hand wash your vehicle with soap and water. If you want to enjoy a couple more extra years of good looking graphics, protect your car from harmful elements through proper cleaning and protection.